Two skins of Neatform glued together to form double sided free standing curved shapes. 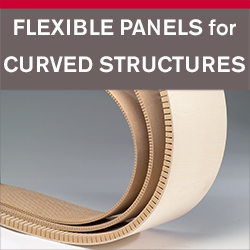 For fabricators who mainly work with bending plywood, the Neatform double skin technique offers fantastic design and fabrication opportunities, whilst saving substantial amounts of time during fabrication and finishing. Applications include reception counters, display units, columns, screens, display panels, stage and film sets. 1. To create a free-standing curved shape with Neatform Bendy MDF, first bend two pieces of Neatform to the approximate shape (grooved face to grooved face), and roughly cut to size. 2. Lay both sheets flat (grooved face upwards) and apply a good even coating of PVA glue to the surface of both sheets, while noting that it is not necessary for the Neatform grooves to be filled with glue. A paint roller is an ideal tool for this job. Please note – contact adhesive should not be used with this method. 3. Place the two sheets of glued Neatform together and bend to the finished shape, while noting that it is not necessary to interlock the grooves. 4. While the glue is still wet, clamp into shape, applying moderate pressure to both faces to ensure a good bond, and leave to set. Follow the adhesive manufacturer’s guidance on curing times. 5. When released the resulting Neatform structure will retain its shape, ready for trimming and finishing.